Beautiful new listing at 24612 S. Desert Flower Dr! Welcome home to 24612 S. Desert Flower Dr! This gorgeous golf course lot home is located on Sonoran #8. The home features two bedrooms, 2 bathrooms, and a Casita. Inside the home, you’ll find 42″ maple cabinets with rope crown molding, granite counters, island, and stainless steel appliances. Neutral tile flooring with medallions and accent inserts and neutral carpet in bedrooms. In addition, a guest bedroom that is split and a guest bathroom that has been beautifully remodeled. Many updates have been done to the home. For instance, the seller replaced all of the windows and added a custom skylight within the last four years. Outdoor at 24612 S. Desert Flower Dr.
Not only is the home located on the golf course but the views are amazing! A private courtyard separates the main house from the guest house. An extended paver patio is featured with an awning on a remote. Furthermore, the water feature and the views of the #8 green make this the perfect place to sit and enjoy the Arizona sun. As a result of storage cabinets and a ceiling that pulls down for attic storage, the extended garage gives you the storage you need. 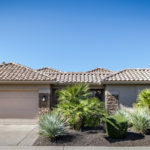 Your new home in Sun Lakes! Above all, living in Sun Lakes is like living at a resort. 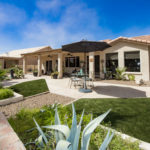 Living at 24612 S. Desert Flower Dr gives you access to golf, tennis, pickle ball, fitness center, restaurants, entertainments, and so much more! Get more information here about 24612 S. Desert Flower Dr, schedule your showing today or call us at 480-440-0849.